On September 14, 2014, Gilead announced a voluntary license (VL) agreement with seven Indian drug manufacturers . The agreement will allow these companies to produce and sell generic versions of sofosbuvir (Sovaldi©) and ledipasvir , Gilead’s direct-acting antiviral (DAA) medications for hepatitis C virus (HCV), in 91 countries . But Gilead’s license excludes countries where 73 million people with HCV live, and prevents them from receiving more affordable generic treatment. Thus, Gilead’s licensing agreement leaves out 46% of people who need HCV treatment worldwide. "It is important to recognize that Gilead’s licenses are a wolf dressed as a lamb. They will hinder access for millions of people in desperate need of HCV treatment, and harm the entire generic industry"
Tracy Swan, Hepatitis/HIV Project Director at Treatment Action Group in New York City. Globally, an estimated 185 million people have HCV . Each year, nearly 500,000 of them die from HCV-related complications, such as liver cancer and liver failure . But hepatitis C can be cured, which dramatically reduces the risk of liver-related illness and death. In clinical trials of sofosbuvir and ledipasvir, the combination has demonstrated high cure rates and improved safety and tolerability, compared to the previous standard of care. Gilead claims their priority is to “increase access to its medicines for people who can benefit from them, regardless of where they live or their economic means,”  but their HCV license actually creates a barrier to universal access by excluding many middle-income countries (MICs) and high-income countries (HICs), by controlling generic competition and segmenting markets. Even in countries where generic sofosbuvir can be sold, if Gilead fails to register its drug and get regulatory approval in that market, the drug cannot be made available there. Therefore, the license does not guarantee access even in the countries included in the geographical scope of the license. Myth: Gilead is making sure that everyone who needs affordably-priced, generic sofosbuvir will have access to it. Fact: This license leaves out nearly 73 million people with HCV who will have to pay Gilead’s high prices. Nearly three quarters of the world’s poor, who largely pay for healthcare out of pocket, live in MICs. Millions of people who need HCV treatment will not have access to generic versions of Gilead’s HCV medicines, the generic versions will be more affordable than the price their governments will get through direct negotiations with Gilead. While HICs and MICs account for 88% of the global HCV epidemic, Gilead’s license covers primarily low-income countries (LICs) in Sub-Saharan Africa, South and Southeast Asia and island nations, many of which have little to no HCV prevalence data or treatment demand. Myth: Gilead is making agreements with generic companies that will increase access to sofosbuvir in LICs and MICs. Block the sale of sofosbuvir outside the license territories, despite pending sofosbuvir patent oppositions. Patient advocates and generic companies have filed multiple sofosbuvir patent oppositions in India, but Gilead’s license undermines their impact. Even if the Indian courts reject the key patent, licensees in India will not in reality sell or export sofosbuvir to non-licensed territories. Control the market even where there is no patent protection: The Gilead license allows seven Indian drug companies to market generic versions of sofosbuvir and ledipasvir in the 91 territories covered by the license. Yet, in many of the included countries — particularly LICs— Gilead’s drugs are not patent-protected. This means that a country could technically buy the drugs from any available source. For example, the governments of Brazil (2.6 million with HCV), Thailand (1.5 million with HCV) and Morocco (625,000 with HCV) cannot buy the generic sofosbuvir that will be produced in India by the seven companies licensed by Gilead — although there is no patent on sofosbuvir yet granted in these countries. These and other countries with large HCV epidemics are victims of a Gilead monopoly, and DAAs will be unaffordable for the majority of people with HCV in these countries. Myth: Gilead says that their reduced US$900 price per course of sofosbuvir is fair. Fact: The same amount of sofosbuvir can be produced—profitably—for US$ 101. Gilead has priced sofosbuvir at US$84,000 for a 12- week treatment course (US$1000 per pill). It must be used with other drugs — and some people may require a 24-week course— making HCV treatment even more expensive. Gilead charges, US$900 for 12 weeks of sofosbuvir in certain low-income countries. 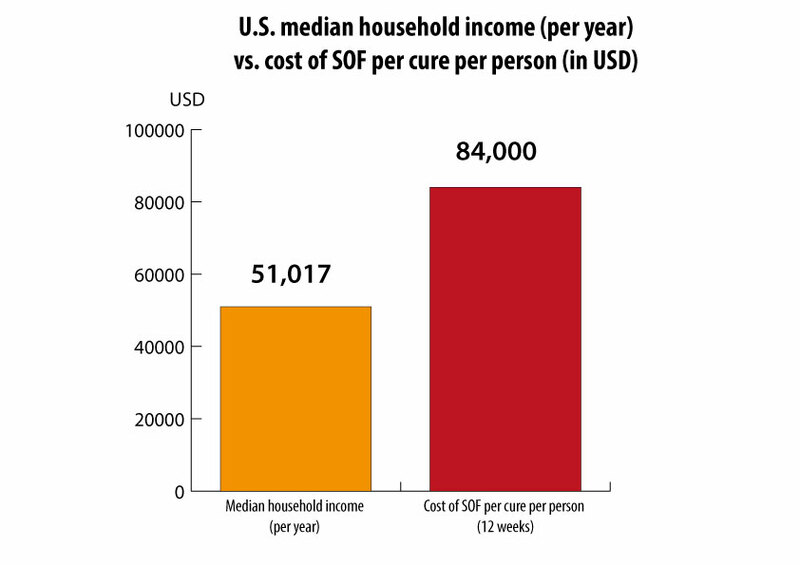 But sofosbuvir can be profitably mass-produced for about US$101. Ledipasvir, one of the DAAs used with sofosbuvir to treat genotype 1, could be mass-produced for only $93. 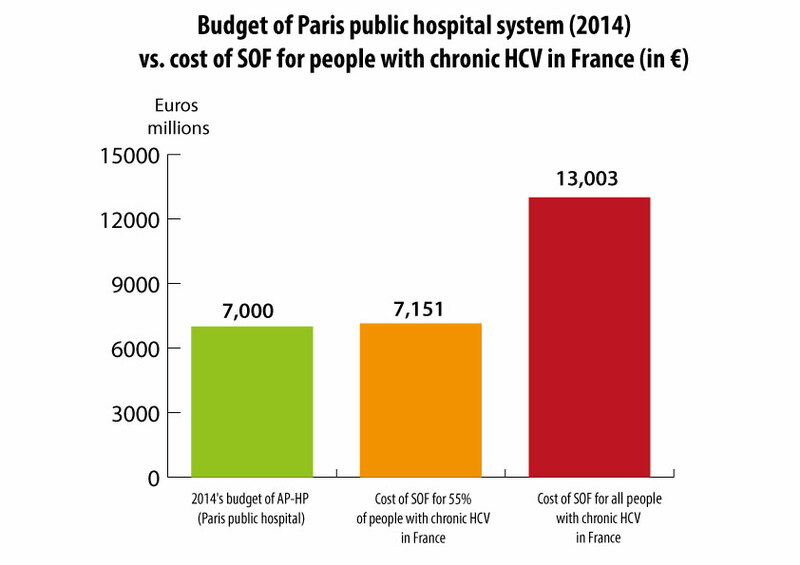 The astonishingly high price of sofosbuvir—US$84,000 for 12 weeks of treatment in the US; currently 56,000 euros in France (US$ 71,300) – is a barrier to access. Sofosbuvir’s price has generated debates about sustainability. In HICs, this price has led to treatment rationing and exclusion of key populations: in many places, treatment access is limited to those with late-stage disease, or denied to people who use drugs or alcohol. Though inadequate access to sterile injection equipment has led to millions of HCV infections among people who inject drugs, HCV treatment is being unfairly withheld from this high-prevalence population. Research demonstrates that people who inject drugs have similar treatment adherence, completion and cure rates to non-users  . Withholding treatment from certain groups based on prejudice should never be tolerated for any disease. In the US, an expert guidelines panel has recommended prioritizing treatment for people with advanced liver disease and severe extrahepatic manifestations. Unfortunately, public and private payers have used this as a rationale for refusing to treat people, without medical evidence to justify their criteria. What will the price of sofosbuvir be in middle-income countries that were excluded from the license? Sofosbuvir’s price will likely be significantly higher than the US $900 price given to Egypt, particularly in the private sector (where insurers or employers may pay for treatment). I-MAK has analyzed the cost implications of the licenses announced by Gilead Sciences on the Hepatitis C drug sofosbuvir. The 3 page report is available here. Inclusion in Gilead’s license does not equal universal access; in included territories, sofosbuvir will still be priced well above the actual cost of manufacturing the drug profitably. Also, Gilead will receive a particularly high royalty of 7% on all sales of the generic versions. Gilead has said it would charge US $300 for one month’s supply of sofosbuvir in India. Yet, HCV genotypes 1 and 3 ( the most common in India), require six months of treatment, bringing the cost to US$1,800—not including the other drugs that must be used with sofosbuvir. Egypt is the only MIC with whom Gilead has finalized a price for sofosbuvir. The Egyptian government purchases it for US $900 (per 12-week course) for use in the public sector, though Gilead may cap the number of treatments it sells to Egypt (where an estimated 11 million people have HCV). Treating HCV genotype 4, the predominant strain in Egypt, requires 24 weeks of sofosbuvir (US $1,800) plus another medication. All the Egyptians who won’t be included in the national program must pay for their HCV treatment out of pocket for drugs on the private market. The price of sofosbuvir will be nearly 6 times more expensive (US $9,000 – $10,800) than the government price; since Egypt’s gross national income per capita per month is slightly more than US $260 , the private sector price is prohibitive for most Egyptians. As the HIV epidemic demonstrated, unrestricted generic competition improves access to essential medicines more effectively than industry-driven approaches, such as voluntary licensing or tiered pricing (where a company charges higher prices in some countries). From early 2000 until 2010, generic competition led to a 90 percent price reduction of key HIV/AIDS medications over a decade. 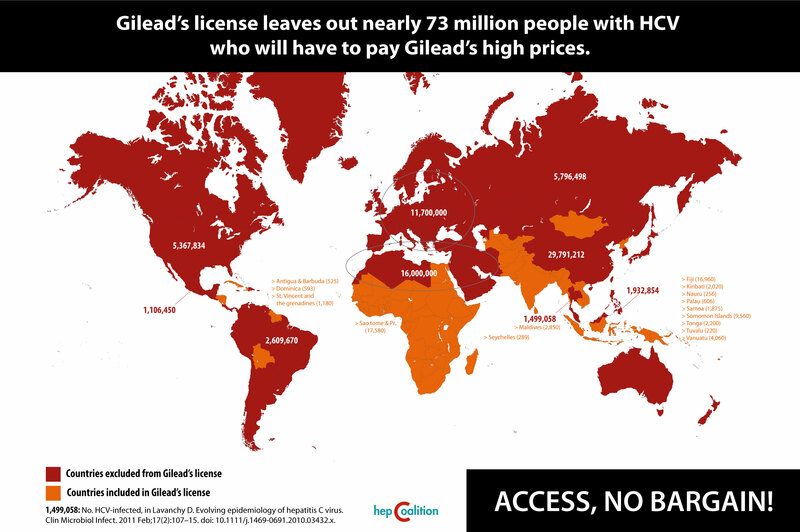 Gilead’s license is a fool’s bargain that inhibits access for nearly half the world’s HCV population. While they restrict access to life-saving medications, Gilead will be reaping an undue profit in poor countries that desperately need these essential medications. It is unclear when people with HCV in countries included in the Gilead license will actually receive treatment; in many places, it will take at least 2 years for generic sofosbuvir to become available. Gilead’s license is undermining rights countries have under international law (also called TRIPs flexibilities) to utilize public health safeguards such as compulsory licensing or defining its own patentability criteria. Sofosbuvir’s registration - approval by each national regulatory authority for each medicine is an inescapable process. But in most countries—including the Eastern European/Central Asian (EECA) region where HCV is rampant - Gilead has not publicized their plan or timeline for registering sofosbuvir (Read EECA CAB open letter to Gilead). This remains a barrier to access for most of the countries. Governments have to take all available measures under global trade rules and national patent laws to secure access to low-cost generic versions of HCV medicines. Governments and treatment advocates must identify Indian generic companies willing to produce sofosbuvir and sell it to countries outside the Gilead license territories. Treatment advocates should continue to hold Gilead and other DAA producers accountable for preventing access to life-saving HCV medicines. 1 The Indian companies entering the license are: Cipla, Hetero, Ranbaxy, Strides, Mylan, Sequent and Cadila Healthcare. 2 Ledispasvir is still under FDA and EMA examination; approval is pending. 4 Mohd Hanafiah K, Groeger J, Flaxman AD, Wiersma ST. Global epidemiology of hepatitis C virus infection: new estimates of age-specific antibody to HCV seroprevalence. Hepatology. 2013 Apr;57(4):1333-42. doi: 10.1002/hep.26141. 5 Lim SS, Vos T, Flaxman AD et al. A comparative risk assessment of burden of disease and injury attributable to 67 risk factors and risk factor clusters in 21 regions, 1990–2010: a systematic analysis for the Global Burden of Disease Study 2010. Lancet 2012; 380(9859): 2224–2260. 7 Hill, A, et al. Minimum target prices for production of treatment and associated diagnostics for hepatitis C in developing countries (Poster LBPE12). International AIDS Conference; 2014 July 20–25; Melbourne, Australia. 8 Hellard M, Sacks-Davis R, Gold J.Hepatitis C treatment for injection drug users: a review of the available evidence. Clin Infect Dis. 2009 Aug 15;49(4):561-73. doi: 10.1086/600304. 9 Van Thiel DH, Anantharaju A, Creech S. Response to treatment of hepatitis C in individuals with a recent history of intravenous drug abuse. Am J Gastroenterol. 2003 Oct;98(10):2281-8.